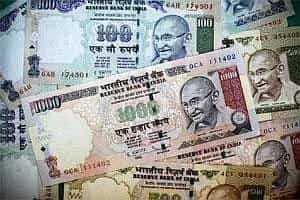 Mumbai: The rupee slumped to an all-time low against the dollar on Monday amid fears that Indian companies will be hit by a global shortage of the US currency as investors, scared by the prospect of further economic turmoil, stock up on dollars. In the past eight sessions, the Bombay Stock Exchange’s benchmark 30-share Sensex index has shed at least 1,600 points. On Monday, the Sensex fell to a six-and-a-half-week low, tracking its global counterparts after yields on sovereign bonds from France, Spain and Italy rose. It lost 425.41 points, or 2.6%, to close at 15,946.10 points, just 154 points away from its year low. The broader 50-share Nifty of the National Stock Exchange slipped 127.45 points, or 2.6%. While both the Sensex and the Nifty are down more than 20% in the year so far, they have lost at least 33% each in dollar terms and are the worst-performing among Asia-Pacific indices. Concerns that US leaders may fail to reach a consensus on budget cuts increased nervousness in the equity market. Foreign funds sold $142 million of Indian equities on Monday, according to provisional data released by the Securities and Exchange Board of India (Sebi). So far this calendar year, foreign funds have bought a net $392 million of Indian stocks against $29.32 billion in all of 2010. Besides demand from companies, the rupee is getting pummelled by sentimental impact due to a weak stock market and deficit numbers, said Ashish Parthasarathy, treasurer at HDFC Bank Ltd.
India has pledged to keep its fiscal deficit at 4.6% of gross domestic product (GDP), a target that looks increasingly unachievable. The current account deficit for the April-June period has widened to $14.1 billion from $12 billion a year earlier. The current account is made up of trade balance and intangibles such as software payments. Planning Commission deputy chairman Montek Singh Ahluwalia on Monday said the deficit target may not be met this year. “It’s going to be more than, I am pretty sure, the budget amount in the current year," Ahluwalia said. “It may not be as much as a 1 percentage point deterioration," he told CNBC-TV18 in an interview. HDFC Bank’s Parthasarathy expects the rupee to continue to weaken. “Though we can’t say how much, the pressure on the currency is strong, which is why even an RBI intervention is not helping," he said. Forex traders said RBI sold dollars at ₹ 51.90, but gave up as the demand for dollars was too strong. “I think RBI is holding itself back because it expects the situation to worsen further as globally things are not looking good," a trader with a British bank said. Structural weakness in the Indian economy together with corporate positions that haven’t been adequately hedged have accelerated the demand for dollars, said Ashish Vaidya, head, fixed income, currency and commodity trading, UBS AG. “Many companies, especially private sector ones, were sitting on underhedged positions because they never expected that the rupee will depreciate so quickly. Now they are in trouble," he said. The rupee has been sliding since July-end. From ₹ 43.86 at the end of July, it has weakened to ₹ 52.15, sending importers’ calculations haywire. “Importers, who generally don’t want to hedge, are now rushing to hedge their exposures, while exporters are delaying their deliveries or cancelling forwards in the hope that they will get better prices," said Vivek Mhatre, head of treasury, Union Bank of India. Dealers expect the rupee to continue to remain under pressure as the one-month forward dollar/rupee premium is quoting at ₹ 52.51 per dollar and three-month forwards see the rupee at ₹ 53.03 per dollar. Traders in the equity market said the current turmoil has proved that Indian markets are not decoupled. “Till recently, people were saying India will be relatively unaffected by the global turmoil and the markets were going up. But now, even the extremely optimistic traders are throwing in the towel," said Mehraboon J. Irani, head, private client group, Nirmal Bang Securities Pvt. Ltd.
“There are issues like fiscal and current deficits. Rupee depreciation has taken away any benefits of lower crude prices and import bills will soar. The only positive now is that everyone is negative," Irani said. Companies whose promoters’ shares are pledged also faced selling pressure. “There have been margin calls and that has contributed to the fall. The market talk is that pledged shares of promoters, mostly in the mid-cap space, have been sold. There could be a brief 100-200-point recovery rally on the Nifty on short-covering, but the undertone is still bearish," said Dev Kapadia, chief dealer at Mumbai-based Lalkar Securities Pvt. Ltd.
On a day the markets opened lower and continued to slide throughout the session, 400 scrips on the BSE hit the lower circuit breaker and 99 recorded new lows. On a sectoral basis, metal stocks fell the most as worries of a global slowdown and the resultant drop in industrial activity saw investors shunning shares of metal companies.